After starting the fructose-free diet, my overall health had not been what I would call amazing. I felt much better than I did when I was eating fructose, but I was still having a lot of persisting symptoms; the worst of which was being intensely bloated all the time–I constantly felt like an elephant in her 22nd month of gestation. I went to many different doctors, most of whom were pretty dismissive and made me feel like I was nuts. The doctor I saw at the Mayo Clinic had me trying different medications, believing one of them would be the answer. My gut reaction was telling me that drugs were not the solution, but I was desperate. Well into taking the third medication he prescribed me with no visible results (and a handful of pesky side effects), I decided I was just wasting time. I did some looking around on the internet for another dietician. This time I felt it was more important to find someone who was willing to listen to me, rather than someone who specialized in FM. I was so pleased with the person I ended up choosing I knew I had to recommend her to everyone else. She does her appointments via Skype or telephone, so it doesn’t matter where you live! Her name is Amanda Wikan at Nourished Life. The first thing we talked about that I want to share with everyone is that if you’re taking Miralax: STOP!!!! It’s super toxic!!!!! That made me really pissed for a couple different reasons. I try pretty hard to stay away from toxins and it turns out I’ve been poisoning myself for about two years. And it makes me so angry that every doctor I’ve been to has been so cavalier about it! 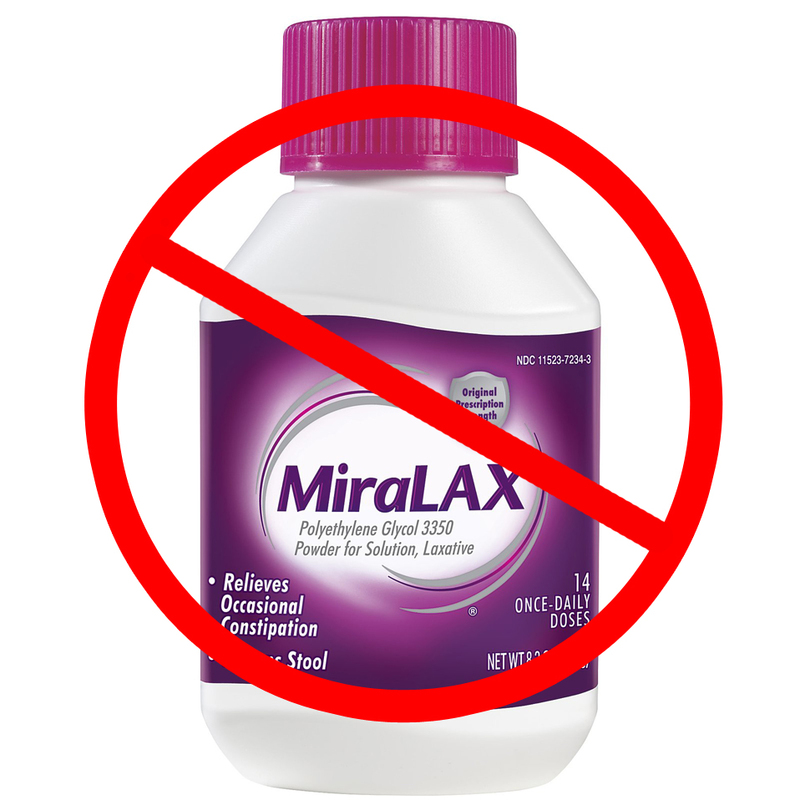 Most of them have encouraged me to take it everyday for the rest of my life because it’s “so safe compared to laxatives.” Here’s an article Amanda shared with me about the dangers of Miralax. Scary. She suggested that I stop eating dairy for about two weeks to see if that makes a difference. Apparently, even though my lactose hydrogen breath test came back negative, I could still be dairy sensitive which is different than lactose intolerance. The first few days of forgoing dairy I felt terrible. Amanda had warned me that I would probably experience withdrawal, but I was not prepared for how intense it was. I was extremely fatigued and I actually craved milk! This prompted me to do a little research on it and it seems that people develop an addiction to milk, similar to opiate addiction. In a few days, after that crappiness passed, I was getting noticeable better. My bathroom activities were normal, and blissfully the bloating was gone. I haven’t quite figured out if I can have cheeses or butter, but I’ve eaten some accidentally since then and nothing happened, so perhaps it’s just the milk that I need to avoid. Finally, I’m feeling well enough to start my elimination diet once again, although I’ll probably have to start from scratch, and I’ll update my recipes if I can figure out ways to make them dairy free. I’m still not perfect (I occasionally get some cramping and my night sweats are still in full force) but I’m at the point where I’m OK with that. At least there’s no looming baby elephant threatening to make his way out. This entry was posted in FM Info and tagged dairy, dietician, elimination diet, fructose malabsorption, milk allergy, miralax dangers by nosugarlessgum. Bookmark the permalink. Isn’t it fantastic to have someone listen and take the time to understand what you’re going through, rather than trying to mold your case to their text books? Glad you’re on the mend and hopefully you don’t have to cut out cheese!